Published by The Writers Trust, December 2012. Amy Harmon, Associate Editor, Multimedia Product Development, Chicago. We have just received your query regarding You Are Already Rich and we are very interested to view the project. Please send it to us at your earliest convenience. We are very curious indeed. Sarah Currer, editor, Multimedia, Chicago. The idea of gifting intangible things to the reader is compelling. You Are Already Rich is light reading, yet very inspirational. I think there are wonderful lessons in this book through the words and stories from different parts of the world. This is an inspiring read. If you say you don’t feel “richer” after reading You Are Already Rich, I won’t believe you. This book roves over all aspects of our lives and tells the stories that open eyes and lift spirits. Brian Morgan shows us how to live and how to view life. I loved it. What a beautiful little book this is. I came across it by accident and loved every page. I realise, now, that I am indeed rich and life will never be the same for me because I look at everything differently now. 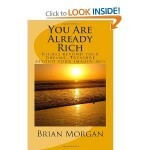 Brian Morgan writes Christmas books, too, but I’ll be adding You Are Already Rich to my Christmas gift shopping. It seemed to me that, on every page, I thought of someone else to give the book to. Easy to read and a sheer delight. I recommend it. This book was given to me as a gift from my mum. I’d been a bit down in the dumps and she said I needed cheering up. Well, this book really does that. It’s a lovely book and really gave me a boost just when I needed it. Full of little stories and glimpses of life from all sorts of angles, this was a wonderful gift and one I’ve nearly worn out. Thank you, mum, and thank you Brian Morgan. I promise you’ll feel better just by reading this book. Like to return from You are Already Rich to the Published Books page?